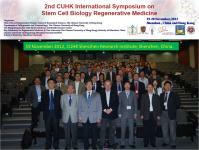 The 2nd CUHK International Symposium on Stem Cell Biology and Regenerative Medicine was successfully held at The Chinese University of Hong Kong Shenzhen Research Institute (CUHK SZRI) and The Prince of Wales Hospital on 19-20 November 2012. The symposium was jointly organized by the Stem Cell and Regeneration Center, CUHK; the Stem Cell and Regeneration Program of the School of Biomedical Sciences, CUHK; the Department of Orthopaedics and Traumatology, CUHK; The Hong Kong Jockey Club Sports Medicine and Health Sciences Centre, CUHK; the Key Laboratory for Regenerative Medicine (Jinan University-CUHK), Ministry of Education, PR China; CUHK SZRI; and the School of Medicine, Shenzhen University. The first day of the symposium was held in the newly established CUHK SZRI in Shenzhen and was attended by over 150 attendants. Dr. Liang Bin, Deputy Director of CUHK SZRI; Prof. Chan Wai-Yee, Director of the School of Biomedical Sciences, CUHK; Prof. Zhang Jian, Associate Dean, School of Medicine, Shenzhen University, and Prof. Cai Dong-Qing, Director of the Key Laboratory for Regenerative Medicine (Jinan University-CUHK), Ministry of Education, addressed the audiences at the opening ceremony while over 20 invited speakers delivered talks at the symposium. The 2nd day of the symposium continued in Hong Kong at The Prince of Wales Hospital. The event was attended by over 200 people with more than 30 invited speakers from U.S.A., U.K., Australia, Sweden, Denmark, Singapore, mainland China and CUHK. Prof. Joseph J.Y. Sung, Vice-Chancellor and President, Prof. Fok Tai-Fai, Dean of Faculty of Medicine, and Prof. Chan Kai-Ming, Director of The Hong Kong Jockey Club Sports Medicine and Health Sciences Centre, addressed the audience at the opening ceremony about the importance and new developments of stem cell research and regenerative medicine at CUHK. The symposium was divided into 4 main parts, namely biology of tissue regeneration, regenerative medicine, technological advancements and translational medicine. Experts shared their latest discoveries, novel research ideas and techniques on various fronts of regenerative medicine. Two best student awards were also given to Ms. Liu Yang and Ms. Zhang Ting, both from Department of Orthopaedics and Traumatology, CUHK. The symposium was the first to have meetings in both Shenzhen and Hong Kong in 2 consecutive days, and received overwhelming good feedbacks from many participants. This symposium has become an icon for stem cell biology and regenerative medicine in Hong Kong. The programme and abstract book of this symposium can be viewed HERE. 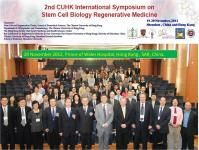 The 3rd CUHK International Symposium on Stem Cell Biology and Regenerative Medicine will be held on 11-12 November 2013, in Hong Kong. Sharing Seminar on "From Innovation to the Market: Commercialization Opportunities and Strategies"
Symposium on "Biomedical Research across the Continents – Insights and Innovation"